Thomson-Shore is a full service book manufacturing company. Our production services start in pre-press and continue through the entire manufacturing process. Your book is in expert Thomson-Shore hands from the time you submit files until it leaves our loading dock. Whether you're an up-and-coming author printing your first hardcover book or an established publisher printing your hundredth title this year, our team of experts is here to help you put your best book forward. Your Customer Care Representative will guide you through the process and help you select the best materials for your book. To assist with your decisions, we'll show you samples of paper, cloth, board, and printed books. We'll also advise you on the details -- such as options for binding, covers and recycled paper options. We even do rounded corners! 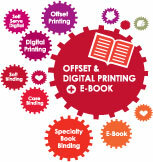 Find out more about the steps for producing an Offset your book with Thomson-Shore, Inc.